Neuroscientist and therapist Mark Waldman, co-author with Andrew Newberg, MD, of How God Changes Your Brain, says that, in culling research on the brain, he found that yawning is one of the top five things we can do to exercise the brain. 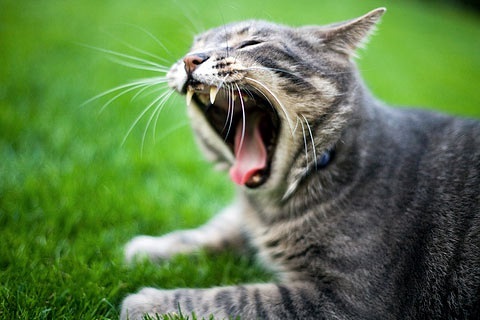 In fact, yawning about 10 times has been seen to be as effective as doing 10 to 15 minutes of relaxation exercises. According to the research cited in the book, yawning increases blood flow and oxygen in key areas of the brain. Yawning has been shown to calm an overly active frontal lobe, release busy thoughts, heighten consciousness and relaxation, generate the sensorimotor rhythm or “coherent state” that happens when the mind is both relaxed and alert at the same time, and build intimacy with those around us. Further, the act of yawning is said to stimulate alertness and concentration; optimize brain activity and metabolism; improve cognitive function; increase memory recall; enhance consciousness, introspection, and athletic skills; lower stress; improve voluntary muscle control; fine-tune one’s sense of time; increase empathy and social awareness; enhance pleasure and sensuality; and relax every part of the body. Who knew?! So get your yawn on with The Energy Yawn, an activity that we’ve been doing with our students in Edu-K for more than 30 years! Make a yawning sound and begin to open wide (pretend to yawn a few times) as you gently massage or stroke away any tight facial areas near your jaw, just below your cheeks by your back molars. Continue until you induce a few real yawns and tears come to your eyes. Make some long, deep exhalation sounds. For a lovely story and illustrations of animals doing the Brain Gym activities, check out Into Great Forest: A Brain Gym® Journey, by Shelley Petch.